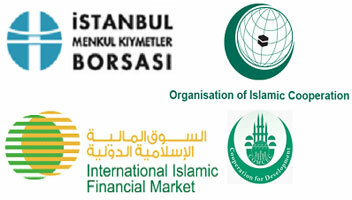 The Sixth Meeting of the Organisation of Islamic Cooperation (OIC) Member States' Stock Exchanges Forum was held on 26th September 2012 in Istanbul, Turkey. The Meeting was hosted by the Istanbul Stock Exchange (ISE). Senior representatives of the stock exchanges and central depositories, registry and clearing institutions operating in OIC member countries, as well as the relevant OIC institutions, were among the attendees of the Meeting. SESRIC was represented at the Meeting by Mr. Nadi Serhan Aydin and Mr. Mustafa Sahin, Centre’s Researchers. The one-day meeting was inaugurated with the opening remarks of Mr. Ibrahim Turhan, Chairman and CEO of the ISE, along with the representatives of the COMCEC Coordination Office, Capital Markets Board of Turkey, and the OIC. The Meeting also hosted a half day seminar on the theme “Collateralization and Tri-party arrangement for domestic and international Islamic instruments” which was organised by the International Islamic Financial Market (IIFM), and a Working Committee Meeting which featured presentations by the Forum’s task forces. During the Meeting, Mr. Sahin briefed the participants on the on-going capacity building activities of the Centre, including its Capacity Building Programme for OIC Stock Exchanges, and the related questionnaire which is regularly circulated to the Forum members with a view to identifying their training needs and capacities and organizing training programmes among their respective institutions. The Forum also took note of various training programmes that were currently being planned by the Centre. The Sixth Meeting also followed the Launch of the S&P/OIC COMCEC 50 Shariah Index in June this year – a benchmark designed by Standard & Poor’s (S&P) in partnership with the Forum which gauges the performance of 50 leading Shariah-compliant companies from the OIC member countries. The Meeting examined through a special session titled “The Way Forward after Launch” the future prospects for and challenges ahead of the Index’s success.